Siemens ovens bring cutting-edge tech into the kitchen. Enjoy cooking your favourite dishes with its latest selection of innovative multi-function, electric, combination and steam ovens. From activeClean to remote oven control with Home Connect, these appliances are packed with clever features to make life in the kitchen easier. 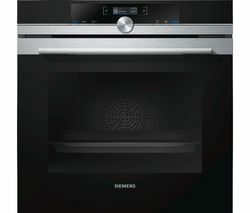 Our Siemens ovens range includes a selection of multi-function electric ovens, steam ovens and oven-and-microwave combinations. Compact or large enough to feed the extended family, you can choose from a range of sizes and attractive steel and glass finishes. Siemens offers some unique features to give you better control over baking, roasting, grilling and steam cooking. Shorten your cooking time thanks to varioSpeed and fast preheat, which ensures you reach the required baking temperature sooner. Touchdisplay Plus gives clear text displays, intuitive operation and is far easier to clean than traditional buttons and knobs. With the Home Connect app, some Siemens oven models allow you to access and control your oven, no matter where you are. 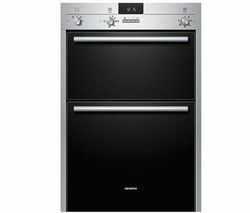 Siemens combi-steam ovens can cook with steam, bake and roast with hot air or do both at the same time so you have the perfect cooking method for any food. With a steamer oven, only hot steam is used to cook the food, for healthier cooking that retains the foods' full flavour, colour, vitamins and minerals without the need for fat or oil. Thanks to activeClean automatic self-cleaning, you don't have to worry about cleaning the oven any more. Just press a button, and your oven cleans itself. Using a pyrolysis process, the oven is heated to a very high temperature that causes any food remnants to turn to ash. You can then simply wipe out the oven. Choose from compact or built-in ovens, in a tall unit or under the counter, and team with one of our gas hobs for total cooking control. Check out our cooker hoods to complete your perfect kitchen set up.